But it can also be quite challenging, awkward and uncomfortable if you and your partner are not in tune with each other and even traumatic if the person or practitioner you are letting into your body just doesn’t feel right. Whether with you partner or with a practitioner there are some things you can do to make sure you receive the most out of this experience. Men you can also read this for your own experience as a giver. It would also apply to you if you were to receive a Lingam Massage. If you have doubts or you feel your body shutting down at the thought, this is probably a sign that you should not be doing it with that specific person. Maybe it’s a practitioner and the vibe is just feeling off… Trust that. Maybe it’s a partner and you are not quite sure about their intention… Trust that. After navigating the Tantric and conscious sexuality scene for a while, there are a lot of people who are going to tell you that in this case you might be hitting resistance…and that you “should” push through them. It might be true or it might just as well be your intuition being really clear with you that now is not the right time or this person is not the right person. After crossing my boundaries many times and not listening to my intuition in order to push through my pseudo resistances… now I have a different look at it. You might have some fears coming up and it’s totally normal but if you feel unsafe to express them or that you have to make a decision now or you feel any kind of pressure to go through with this experience… I would recommend you not to and to only make that decision when you feel a full YES in your body… As I say feeling a bit anxious is normal as any new experience bring a sense of unknown but it’s quite different to not feeling fully ok about it and doing it anyway. When we open our bodies to people who we are not fully ready to open with and do not feel totally safe with… it can create more damage that anything. Think about it… It’s like going against yourself. Do you think true healing will come from that? 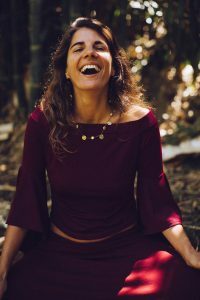 Someone may have some great recommendations and seems to be this incredible teacher but if your body is saying no… and you ain’t feeling a big YES… well it’s a no. Until you find the right partner or right practitioner, you can always come to one of the Yoniverse workshop to learn how to give yourself a Yoni massage. So the experience of Tantric massage can be the most incredible experience when you can really drop into your body. However when your partner might have just learned it… maybe by coming to our one day workshop, he might be feeling awkward, unsure about himself, uncomfortable or worried whether he is doing it right. Now let me tell you that it’s really hard to surrender into the hand of a novice. It’s like giving a Ferrari to drive to someone who just got their permit… Not really relaxing! Well, here is my take on it: drop the receiving and the whole sacred aspect of it and be very real and open with each other. As you are receiving the body massage, share what feels really good, what touch helps to soften you and tell your partner what doesn’t work, guide each other… Try things and ask your partner “how is that?”, give yourself permission to try. When you start you have to tune to each other in this new practice and then you can let go. Do this a few times until you both feel comfortable, your partner comfortable and confident to give to you and you trusting him enough that you can trust him with you body and allow yourself to let go. Once you have got this out of the way, you will be more able to both be in the experience rather than in your head. And now what’s your job as the receiver? And it can be from an array of reasons. It can be from too much brain activity after a busy day and not enough practice of calming the mind. t can be from a resistance to receive and unfamiliarity with letting go of doing. It can be from not being used to feeling deeply. And of course if you have deep trauma and used to leave your body as a coping mechanism, this might also come up during the massage. This usually accentuate the sensation and bring a lot of relaxation and feeling in my body which make it easier to stay present with. If some big stuff is being triggered and you can feel yourself leaving your body, please remember you can always ask your partner to pause, hold your heart and bring yourself reassurance that you are safe. Only move forward if you do feel that safety and feel yourself fully back in your body. If you can’t bring a sense of safety back, you can always decide to stop for this time, just ask to be held or whatever else you need. I would recommend if that is the case for you to seek external support outside of your relationship. Body based therapy like somatic experiencing are great to explore trauma. You might have all sorts of sensations and emotions as well as insights or visions during the massage. Give yourself permission to go there. For me it’s always such an inward journey, I feel I travel through time and space and receive so much ancient wisdom and guidance. And if you want to turn this experience into next level heart opening, seat together in ceremony and drink some ceremonial cacao together, infusing the intention into your drink before you sip it slowly. Ceremonial Cacao is so heart opening and could take you both to a whole new level of feeling and connectedness. I love the mission and vision of https://www.flykakao.com/. This is where I get my cacao from. You might have some barriers to break, some societal conditioning about what is appropriate or not. If you feel an urge and can not express it because of any sense of shame or feeling self conscious, discuss it later with your partner so that next time you can know that it might happen again and you will feel more free to let go and express. Part of the practice of Yoni Massage is to give yourself permission to fully express what comes up in each moment and it can be a journey for both of you… You expressing the wild and untamed and your partner witnessing the wild and untamed. And this journey is a journey of freedom in expressing all aspects of yourself without shame… and gosh what a gift to do that together. On that note, if you are going to see a practitioner, I would assume that the practitioner would create a space for you to fully express, it would be part of the introduction chat that we would have if we had a session together. If your practitioner doesn’t mention it, do not hesitate to voice your fears around expressing and what you are afraid to express (and that might include farting… This might sound funny but It’s actually a very common fear for women I give sessions to) until you feel reassured that everything, every part of you is welcome and you are free to let go in your expression. Please if you have any questions or comment feel free to email me at hello(at)theyoniverse.com. Yoni massage is one of the most incredible experience a woman can have of her body but it is also delicate and I really wish this simple tips help you to create the foundations to receive its power and potency. If you are a men and you would like to learn how to give such an experience to your partner, make sure to check our Yoniverse Masterclass. And if you are in a relationship and would love to learn how to give each other deep experience of Tantric Massage to each other, please check out our Yoniverse Couples Retreat, this is what I wished every couples could experience to deepen together and have the tools to keep deepening together. Elise Savaresse is one of the co-creator of The Yoniverse.